* I may have let the cream cook for a few seconds too long. Hopefully it’s ok.
* Forming the tart crust is a bit easier than doing a pie, since you can patch up mistakes pretty easily. * One small package of pie weights is not nearly enough; I’ll have to pick up a few more. * This is a multi-step recipe with lots of downtime so plan accordingly. No part of it is particularly difficult. * I didn’t glaze it. Hopefully it’ll taste good too. 1. For the Pastry Cream: Heat half-and-half, 6 tablespoons sugar, and salt in medium heavy-bottomed saucepan over medium heat until simmering, stirring occasionally to dissolve sugar. 2. Meanwhile, whisk egg yolks in medium bowl until thoroughly combined. Whisk in remaining 2 tablespoons sugar and whisk until sugar has begun to dissolve and mixture is creamy, about 15 seconds. Whisk in cornstarch until combined and mixture is pale yellow and thick, about 30 seconds. 3. When half-and-half mixture reaches full simmer, gradually whisk simmering half-and-half into yolk mixture to temper. Return mixture to saucepan, scraping bowl with rubber spatula; return to simmer over medium heat, whisking constantly, until 3 or 4 bubbles burst on surface and mixture is thickened and glossy, about 30 seconds. Off heat, whisk in butter and vanilla. Transfer mixture to medium bowl, press plastic wrap directly on surface, and refrigerate until cold and set, at least 3 hours or up to 48 hours. 4. For the Tart Pastry: While pastry cream is chilling, whisk together yolk, cream, and vanilla in small bowl; set aside. Pulse to combine flour, sugar, and salt in bowl of food processor fitted with steel blade. Scatter butter pieces over flour mixture; pulse to cut butter into flour until mixture resembles coarse meal, about fifteen 1-second pulses. With machine running, add egg mixture and process until dough just comes together, about 25 seconds. Turn dough onto sheet of plastic wrap and press into 6-inch disk. Wrap in plastic and refrigerate at least 1 hour or up to 48 hours. 5. Remove dough from refrigerator (if refrigerated longer than 1 hour, let stand at room temperature until malleable). Unwrap and roll out between lightly floured large sheets of parchment paper or plastic wrap to 13-inch round. (If dough is soft and sticky, slip onto baking sheet and refrigerate until workable, 20 to 30 minutes.) Transfer dough to tart pan by rolling dough loosely around rolling pin and unrolling over 9- to 9 1/2-inch tart pan with removable bottom. Working around circumference of pan, ease dough into pan corners by gently lifting dough with one hand while pressing dough into corners with other hand. Press dough into fluted sides of pan. (If some edges are too thin, reinforce sides by folding excess dough back on itself.) Run rolling pin over top of tart pan to remove excess dough. Set dough-lined tart pan on large plate and freeze 30 minutes (can be sealed in gallon-sized zipper-lock plastic bag and frozen up to 1 month). 6. Meanwhile, adjust oven rack to middle position and heat oven to 375 degrees. Set dough-lined tart pan on baking sheet, press 12-inch square of foil inside frozen tart shell and over edges and fill with metal or ceramic pie weights. Bake until golden brown, about 30 minutes, rotating halfway through baking time. Remove from oven and carefully remove foil and weights by gathering edges of foil and pulling up and out. Continue to bake until deep golden brown, 5 to 8 minutes longer. Set baking sheet with tart shell on wire rack to cool to room temperature, about 30 minutes. 8. Bring jelly to boil in small saucepan over medium-high heat, stirring occasionally to smooth out lumps. When boiling and completely melted, apply by dabbing and flicking onto fruit with pastry brush; add 1 teaspoon water and return jelly to boil if it becomes too thick to drizzle. 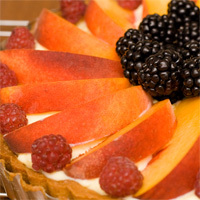 (Tart can be refrigerated, uncovered, up to 30 minutes.) Remove outer metal ring of tart pan, slide thin metal spatula between bottom of crust and tart pan bottom to release, then slip tart onto cardboard round or serving platter; serve. what are pie weights? can’t you just use a bag of beans? Do beans conduct heat well? You can use pennies too. I think pie weights are ceramic. this tart was DELICIOUS. i might have to switch to your pastry cream recipe.